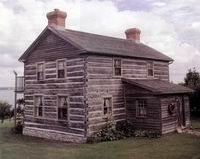 Log houses are perhaps the most recognizable of early North American building types. They are found in many parts of North America. In Canada, The Upper Ottawa River Valley has perhaps more antique log buildings than anywhere else in the world. This historic waterway, the divide between Upper and Lower Canada, was the route that opened much of the continent 's heartland to exploration, the fur trade, lumbering, agriculture and settlement. From the early shanties to substantial 19th century homes, log was the material of choice in this land of giant pine forests. Many of these buildings have survived into the 21st century. Some have fallen into disuse or have been displaced by recent development. For more than 25 years we have been relocating and restoring the best available examples of these historic structures and adapting them for modern use. The design and materials in these buildings has passed the test of time. 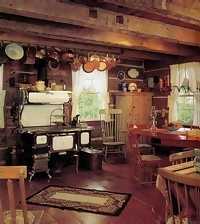 A properly detailed reconstructed log house will last indefinitely. During reconstruction every log that is to be reused is carefully checked. Damaged logs are either skilfully repaired or replaced using similar antique material. Log houses are found in a wide range of sizes. Present day standards favour larger buildings for residential use. We sometimes find original houses as large as 2,000 sq. ft. with a full 2nd storey. Often we combine a number of buildings to create a larger home or design and build appropriate additions to increase the size and utility of a home. Occasionally an outstanding large hewn log barn becomes available. They have great potential for residential use. Some of the smallest buildings have the biggest reputations. It seems that the lesser the square feet the greater the number of children and the more famous they became. Today we most often rebuild these smaller buildings for occasional or auxiliary use. From a cabin-in-the-woods to a backyard Bunkie the small log building is a fit in many situations. Smaller projects can offer a good opportunity to do a complete restoration, with every detail authentic. To help achieve this result, in projects of any size, we offer a good selection of antique hardware, old window glass, antique doors, hand planed wall board, wide pine flooring, weathered siding, and such.